This is the OEM factory part directly from Dodge. Fits all RAM SRT10 2004-06, up to 600 ft lbs of torque. *Does not include alignment tool, or Pilot bearing or throughout bearing. Fits all Viper Trucks 2004-06, up to 800 Ft Lbs of torque. Need a better clutch for your Viper or Ram SRT-10 but don’t want to spend the extra money needed on hydraulics that the Centerforce clutch requires? Here’s your answer! South Bend’s Performance clutch for the Viper engines features a high performance organic facing for smooth engagement and higher clamping force than the stock clutch setup. It does not require upgraded hydraulics to use. Engineered for HP modifications. This Heavy Duty Pressure Plate has an increased clamp load with little increase in pedal pressure. The Organic disc material has a high metal content that increases the co-efficient of friction by two times over a stock lining and increases rotational strength up to a 12,000 RPM burst point. 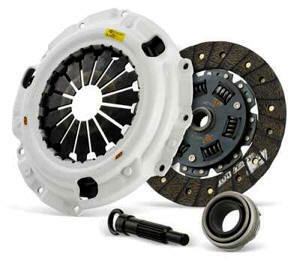 This clutch system maintains a stock feel while offering strength and durability. Comes with two main components: Pressure plate & Friction disc, plus Pilot bearing and alignment tool. Fits all Viper Trucks 2004-06, up to 1000 Ft Lbs of torque. The next higher upgrade from stock. 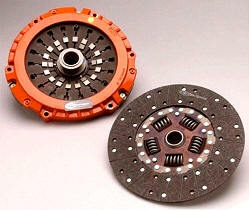 This clutch system is designed for the racing climate. The pressure plate is precision balance for vibration free operation at high RPM. 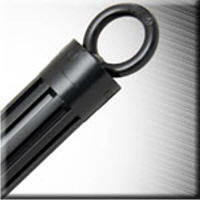 The pressure plate fulcrum is altered for a positive disengagement and a quick shift. The disc is engineered with a Dual Damped design to provide accurate control when accelerating through corners. The friction material is a hybrid using a full face Feramic (Sintered Iron) lining on the flywheel side and a high metal content Organic lining on the pressure plate side. Engagement is positive yet buffered due to the high graphite content unique to Feramic facings. Recommended uses are daily and street with an emphasis on Rally and Endurance racing. Fits all Viper Trucks 2004-06, up to 1200 Ft Lbs of torque. The Highest upgrade from stock. Drag racing requires a Single Mass SFI approved Flywheel to be included with each kit when the original design is Dual Mass. This system features a Heavy Duty Pressure Plate modified for a puck style disc with no cushion between the linings to keep the clutch pedal travel short and quick. The puck design disc reduces rotational mass and total drive surface area while increasing pounds per square inch on the surface of the friction material. This combination minimizes inertia, accelerating the transfer of torque from the engine to the wheels. The friction material used for this race application is Graphite Impregnated Ceramic. This compound exceeded all other friction materials when testing for durability, reduced chatter, heat transfer and torque capacity. Recommended uses are drag racing, drifting and limited street. Pilot Bearing or Bushing (when applicable). 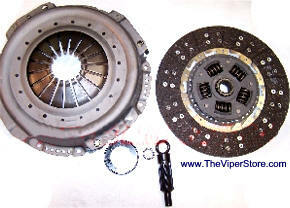 For Viper Trucks 2004-06.The FX300 Clutch System uses the Power Plus I Pressure Plate with a Steel Back Segmented Kevlar disc. 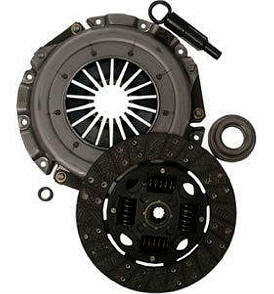 This clutch is designed for the ultimat e street enthusiast or weekend racer running a normally aspirated car equipped with cylinder head work and/or hotter cam(s), or with medium-boost turbo or super-charger, or up to 100hp NO2. The FX300 features only slightly increased pedal pressure, long life disc and positive engagement. For Viper Trucks 2004-06.The FX400 Clutch System uses the Power Plus I Pressure Plate with a custom, extremely durable, Sprung Ceramic disc. This is the ultimate extreme duty street and/or road/drag racing system. It has a 6 wing (paddle) configuration. The sprung hub design allows for moderate dampening in high-torque applications, rendering it much more street able than solid or rigid designs. This disc is designed for long life, outstanding holding capacity, and rapid heat dissipation. Warning: Due to the solid (no Marcel) friction rivet design, the FX400 disc engages very quickly and may SHATTER slightly in first and reverse. To help alleviate this problem, we only use premium ceramic friction material. For Viper Trucks 2004-06.CENTERFORCE DUAL FRICTION CLUTCH PRESSURE PLATE and DISC -- 90% Power Holding Increase, 26 Spline X 1.125 in. Input Shaft, 12 in. Disc Diameter, Organic Disc Material, Sprung Hub Disc Hub Style, Diaphragm Pressure Plate Style, This High Quality Part Is Perfect For 4WD Vehicles And Highly Recommended For Use With Engines Producing High Horsepower And Big Torque Output, Specifically Engineered To Deliver The Ultimate In Street Or Strip Holding Power And Performance Without Sacrificing Pedal Effort And Driver Control, Centerforce's Patented Centrifugal Weights, Premium Friction Materials, And Patented Machining Process Provide A Performance Clutch With Exceptional Street Characteristics That Offer Outstanding Holding Capacity And Durability, Features Full Facing On The Pressure Plate Side And A Carbon Composite Puc Style Facing On The Flywheel Side. Does Not Include Flywheel, Throughout Bearing, Alignment Tool, And Pilot Bearing. CENTERFORCE DUAL FRICTION CLUTCH The alignment tools offered by Centerforce are standard alignment tools in black plastic. One alignment tool can be used for many different installations for the same application, leaving no need to replace the alignment tool with each clutch. 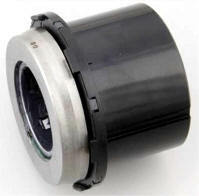 CENTERFORCE DUAL FRICTION CLUTCH Each pilot bearing or bushing sold by Centerforce is the highest quality available. In most application the bearing is a direct Original Equipment (O.E.) replacement. Centerforce recommends changing the pilot bearing/bushing and release bearing during every clutch install.